I have been using this app for quite a few years now, and it is simply the best out there. It is a must for anyone who enjoys keeping important recipes in one place. I love the fact that I can speak the directions – this is a must for us one finger typists. I loved this app until it stopped working with AllRecipes.com. Can’t import recipes anymore. Really disappointing. I'm a little surprised not to see a check off list for when ingredients are added while preparing a dish, in this latest release. :-( Will there be a check off list while adding ingredients while preparing a dish ?? I love this app. However, in the last few days I cannot put in the time. The number part works but not the minutes or hours part. Never had a problem before. This is why I gave it 4 stars. Been using for 3 years!! I've been a user for at least 3 years, the easy import feature, access across all devices, and easy to share functions make this a home run. This app is simplicity at its best. Easy to use, all the right features. It's a great value. Please update!!!!!!! Won’t import anymore! I have used this app a lot over several years, but recently it will not allow me to import. Very disappointing. I would have given five stars prior to this happening. In the last several weeks, whenever I try to use the easy import function, it doesn’t import the recipe at all. I have used this recipe app for a number of years. Enjoy both the custom import and easy import feature, the grocery cart and forwarding recipes to friends. However, not sure what is happening but none of the easy import sites work well, nor does the custom import. Please help! I used to love this app. However, it is not dependable anymore. Most of the time it won't import. It just twirls and twirls. Cooking Light, which is one of my favorite sources, won't find recipes at all. PLEASE FIX and I will update my review. This was the one reason for having this app and made it so easy. Now with the easy import not working, what’s the point of the app? I might as well just google everything because it’s easy then searching in the app. I like this app for keeping recipes, but the sharing function does not work. If I hit share and then choose text, it will share “I’m Making ...” but won’t actually include the recipe. I love this app and I have been using it for many years. However, I need to be able to type in recipes much faster than the process it takes to type it in through my iPad. I have many of my mom’s old recipes that I would like to put on my app, but it takes forever to do one recipe at a time. This app needs a computer version in order for the process to be much faster. I am not importing off the Internet, I am putting recipes in the app that are written down in cursive. For some reason the easy import is not working when I’m in food network trying to import a recipe. I have to do the custom, which is a lot more difficult. It was great for awhile, but now it won’t save recipes anymore. It says it’s importing, but then it doesn’t show the saved recipe and when I go look for it in my recipes, it’s not there. I’m really disappointed. The Easy Import tab appears on many recipes I’m trying to import but it rarely works. “Importing..” flashes for a couple of seconds but nothing happens. I’ve updated the app to latest version, but no difference. This was a favorite app of mine but I can no longer add recipes using my iPhone. Easy import no longer working for me and after looking in the App Store the grocery list portion needs a lot of work compared to other apps out there. Switching to something better. I’ve stored my recipes in this app for a long time. I loved it! It was perfect. But now when I look at all my recipes I have to scroll through “recipe book selections” to find my stuff. When I click “all my recipes” I want MY recipes, not the visual clutter of someone else’s. This app is easy to use and feature rich. I’ve been using Recipe Book for over 5 years and I Love it! I’ve evaluated other recipe book apps and they have always fallen short in comparison. I do have one item on my wish list and that is the ability to create a PDF file of my recipes. You can’t search just any website you want but only the 7-10 websites that this app has allowed. Very limited. Might as well just take a picture of the recipe and store the pic in a folder rather than spend the extra dollar for this app. Disappointing. My go-to recipe book. Great for developing, editing, and storing recipes. Use it every day. App seems nice but the category selection is not working so I can’t section off my recipes. I used to use an app called hot pot to download recipes from the Internet and to enter my personal recipes. It was apparently discontinued and I’ve been searching for about a year for one to take its place. I have purchased multiple apps with poor results until now. This one fills the bill plus does everything a lot easier. It allows me to download recipes and once they are imported to scale up and down. It also will easily creat a grocery list. The only thing that I would like to see improvement in is the search engine on the Internet browser. I have just one question.....Is this also available for my android phone? I love this app but have a feeling that it is Apple only? 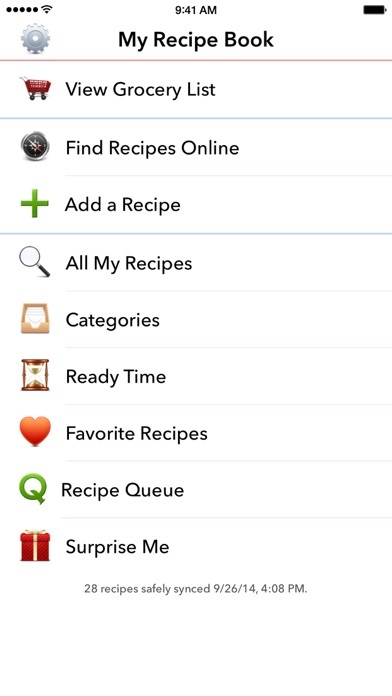 This is THE killer app for recipes. Better than anything I've ever used. But it desperately needs support and updating. The share feature would be awesome to have but it doesn't work at all. Making sure the app's functionality remains up to date with latest iOS versions is essential too. If it's a money thing, I would pay for this app if it meant more support. The "cutting board diary" UI design needs to go! This skeumorphic abomination belong in a museum! I love the program! Could you add: Rate a recipe? Rest or proof time? It’s a possible to use the program on her computer? Also can I share my recipes with my children who have android devices? I have had this app for several years and literally use it every day. With the most recent update, however, I have lost a little functionality. When browsing on-line sites to upload new recipes, I can no longer navigate around the site. If I browse a recipe and then want to go back to the previous page, there is no way to do it. My only option is “Done” which takes me back to my own recipe list. There used to be an arrow that would take me back to the previous page rather than kicking me out of the online site. It is a bit frustrating and I hope you can address it! Otherwise, this has been a very useful and enjoyable app! Edited 4/28/18 : WOW! Fixed my problem! Thank you, thank you!! Apple Watch app stopped working. Crashes every time I launch please fix. I’ve used this app for years and it is the only app for me. I sent in a very small issue yesterday after recent update. I received an email response in a an hour or two, and then today got another email telling me about the update to fix the issue. One day! That is impressive and awe inspiring. Thanks so much and if you ever stop I’ll be lost. 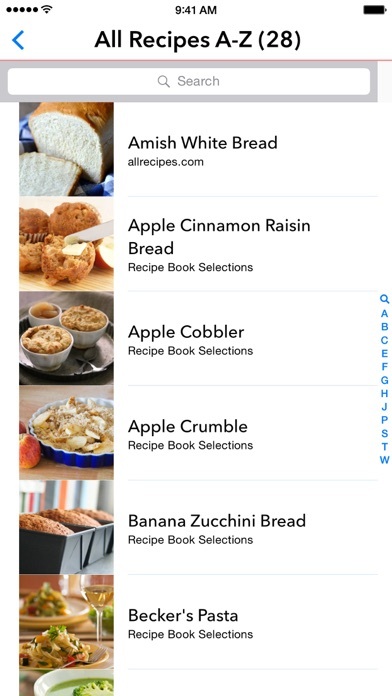 I have so many original recipes and finally an app in which I can keep all of the recipes together. Photo's easily added and sending recipes to friends and family makes this my number 1 app!!! If you have your own recipes this app is for you!!! I love it. I cannot live without it. I love this app, have been using it for years. Unfortunately with the last update, the app does not show a full screen shot. Something has gone wrong. Please send a fix ASAP! I have almost 3000 recipes which I would hate to loose! Always use the app and love it. But the latest update will not show full screen on 12” iPad Pro. Will you ever make the app compatible with Droid and Samsung devices? I have had this app for several years and literally use it every day. With the most recent update, however, I have lost a little functionality. When browsing on-line sites to upload new recipes, I can no longer navigate around the site. If I browse a recipe and then want to go back to the previous page, there is no way to do it. My only option is “Done” which takes me back to my own recipe list. There used to be an arrow that would take me back to the previous page rather than kicking me out of the online site. It is a bit frustrating and I hope you can address it! Otherwise, this has been a very useful and enjoyable app! I’ve had this app for about 4 years and have always loved how it worked until now. The latest update made it much harder to see the recipes on the full screen of iPad. 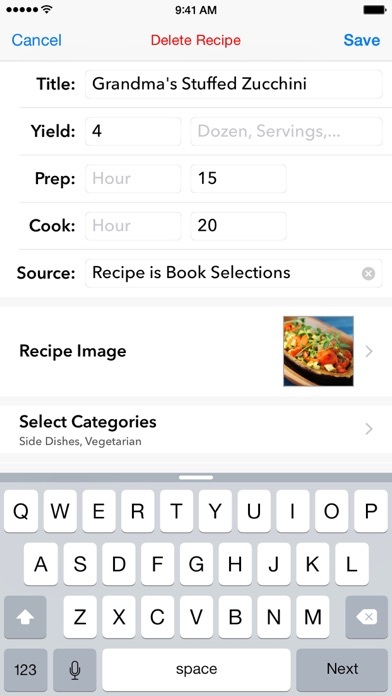 Some of the icons jump to over and cover part of the recipe when in landscape or enlarge print. It almost looks like I have the phone version on my iPad now...which I do not. I was able to scan the list of recipes and glance at individual recipe on same screen when in landscape....can no longer do this. I did not have these problems previous to the update. Please change the app back! 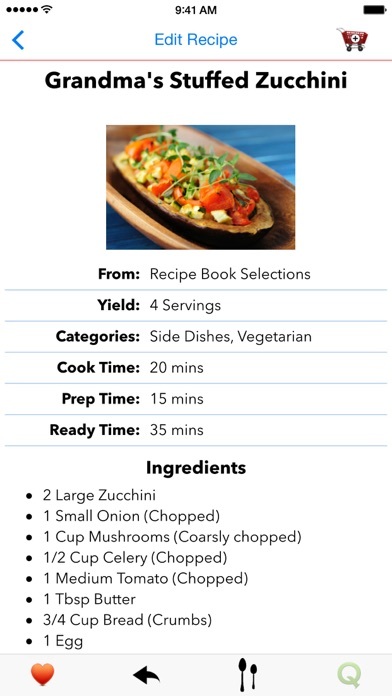 I have been collecting web recipes in Evernote and buying ebooks of cookbooks. Evernote gets strange formatting issues sometimes that you can’t seem to fix without desktop version. And trying to cook with the kindle app is so frustrating with all the formatting quirks and terrible searching functions. So I’ve started compiling everything into this app. It’s a bit tedious by hand but worth its weight in gold for the organization feature. Having timers built in is sweet too so I don’t have to yell, "hey Siri...Hey Siri! set a timer for 15 minutes" Siri: ok I’ve set a timer for 50 minutes. 4 things I wish for in this app: Add a prep drop down like the ingredient name so I can choose "chopped, minced, etc..." rather than have 10 different listings of onion as a ingredient. Would also make the grocery list so much cleaner too. Another would be the ability to bold, highlight, and/or color text in the directions. I have a habit of skipping over ingredients and it would help to make them stand out more. It would also be nice to tag each direction with estimated time for completion so when making multiple items or meal prep, I can be much more efficient. The last would be to tag grocery list items to the recipe so if I change my mind while shopping, I don’t accidentally skip something I shouldn’t of or buy something I didn’t need. What has this update done!! Love this App have been using it on my iPad and iPhone for 5 years, outside of slow to load on my iPhone it is great but today when I logged in on my iPad Pro it is coming across as 1/3 of the page. Please fix!! What has changed with this app? I’ve been using this app on and off for a few years, and always found it to be easy to use, even when using “Custom Import.” Lately, though, when I have to import manually, the app doesn’t let me capture all the information I need for each category and runs all the ingredients together, rather than putting them on separate lines. Frustrating and always takes additional typing and cleanup. There must be better apps out there. Trying to replace an outdated app that I liked very much. Need customize able categories and perhaps a description field Need to make picture selectable so you can view a bigger image if you tap on it. I Still Love this app! Just love it! But can’t download Taste of Home. So easy to use and love the ability to download and add recipes from my favorite places. I have always liked this app and use it quite a lot. However it has been getting worse as far as crashing. It crashes all the time. It could be when I’m opening the app itself or opening a recipe or doing a search. It doesn’t seem to matter. It is getting to the point where it is really quite irritating. I never know if it is actually going to work. I use an iPad, about a year old, don’t know if that makes a difference or not. Anyway I would appreciate any suggestions you have. I really do like your app and appreciate it very much. Thank you. I have had this app for several years now and love it! I only wish it connected to my Mac computer so I can download recipes from there instead of my iPad or phone. Otherwise it’s great and it is super helpful that it connects my grocery list from the iPad to the phone. I’ve been using this app for years now to save new recipes from the internet & store old favorites. They always support iOS updates. Works perfectly! I like this app and it seems to be the only one of it's kind. I have used it for a while and have a ton of my recipes saved here and they are all safe in the cloud so I do recommend it to anyone that's looking... BUT... I do have some complaints, first and foremost the easy import feature no longer works, next; at one point you could add custom categories and multiple per recipe, please bring that back it was very nice. Lastly this app desperately needs a notes section for recipes so that I don't have to put special instructions in the directions, they get numbered that way and the format makes it difficult to find "notes." Developer, I hope you'll consider those things because you really do have a good app. Love this app but it doesn’t work anymore! Cannot add recipes found online via easy import or manual method. Please fix!!! Developers MIA - Won’t update App!! The developers won’t update the app and there is no way to get in contact with them to see if they even plan on updating it. The easy import doesn’t work anymore, which is the really only upside of this app. Wouldn’t recommend. Can no longer import recipes from online — not using easy import or custom import. I have loved this app for years and recommended to many friends. Thought it would not work because I had iPad 2 so bought a new iPad and it still doesn’t work!!! So sad! I used to love this app, but, for quite awhile now I have been unable to download any recipes from any site. I find a recipe that I like, and hit the “import” button and it says “importing” but I get nothing. Now if I want to add a recipe to my book, I have to print a copy from a website and then manually enter it. Something needs to be done with this problem. I have deleted the app, reloaded and signed in again, and my recipes are there, but, I cannot get any new ones off of any of the sites, whether I try easy import or another import. I am starting to transfer my recipes to other apps now, as I don’t know how long this one is even going to be working and I don’t want to lose the recipes I already have. I love this app. I have never had any problems with it and it does all that the description says it does. Thanks! Icon just flashes and goes blank. 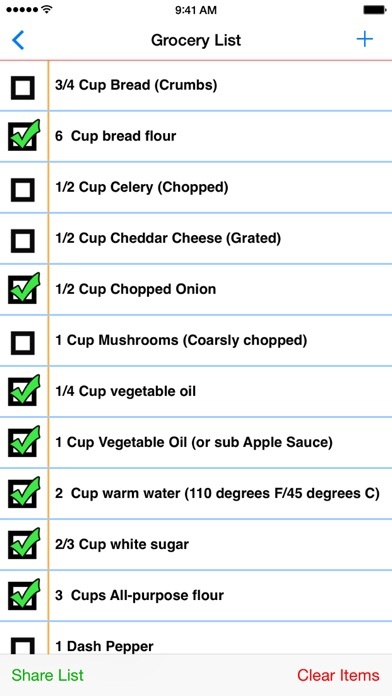 Still works on IPhone, thank goodness, because I have hundreds of recipes there. I’ve depended on this app for years and am extremely disappointed that it has failed. I love this app. I have used it to capture family recipes and also favorites we find online. I modify them when I need to and share with family and friends. Make grocery lists and more. It is by far my favorite app. And the best recipe app that I’ve found and I have tried many. THANKS! This may be my favorite app on my phone or iPad. I have over 200 recipes saved and I share them with many family members and friends. I love being able to sort by categories and even create my own categories! The best feature, in my opinion, is the ability to scale a recipe up or down for larger or smaller groups!!! I have loved this app for several years, but it hasn’t been updated in 7 months. It still doesn’t import recipes like it once did. Very disappointed. Looking for alternatives. Honestly I don’t enjoy giving this app a harsh review. I have used this app for years, I loved it. I could save photos of my recipes to the app, I could easily import from multiple sites, I could even import from any website, with a little work on my end. And, now, not so much. The photos on my phone won’t save. When I go to AllRecipe or other linked sites, just forget about random food websites, it won’t save, easy import or manual import. And, best yet, I can’t export. I think someone moved on, and forgot to let anyone know. It’s not worth wasting time putting recipes into an app that is sitting with the other misfit toys, waiting for someone to come along and save it. Spend your money on an app that keeps improving. You’ll be happier. You’re welcome. Had this app for a couple of years and it’s wonderful having one place to keep all my recipes. Almost ready to say good by to my recipe box. Each time I take a card out of the box to prepare the recipe, I enter it into this little app. That way I don’t get overwhelmed imputing them all. Not operating up to par after iOS updates. Help!! I’ve had this RecipeBook for a couple years and I love it! All my recipes are backed up and saved. You can even download recipes from certain websites. I have been using this app for several years. I have not been disappointed. It is nice to have the app on my iPad when I am cooking and also on my phone if I am in the grocery store and need to see the ingredients I need to pick up. Very happy! This would be good if it auto populated better. Been using this for at least 7 years and love it. The easy import option doesn’t usually work for me even on the sites it says it should, but custom import is fine. I hope this never goes away cuz all my treasured recipes are stored here! I am so happy this app is being updated to be compatible with the new iOS update. This is my one and only app for storing my recipes. I was recently thinking what would I do if it were to be put by the wayside by the developer. Thank you for continuing with this great app! The tutorials are wonderful as I am not a big techy! This app is well worth it! You could have also updated a version release date, real programmers play like that. I feel strongly that a "cutting board diary" UI design needs to go. Dinosaurs belong in a museum. I really love the ease of using this app. I wish the developer would make it compatible for my MacBook! This would make it perfect! One of the most useful features of this app was easy import, where you could find a receipt on line and import ingredients, photos and steps. It no longer works, therefore the app is almost a waste of your time. Need to be fixed and I will increase my review. I’ve had this app for years, and I loved it. I bought a new iPhone and transferred all of the information from the old to the new! When I opened the app, all of my recipes were gone! I’ve emailed the contact info but no one responded. Fortunately I kept my old phone, but having to retype everything isn’t fun!!! This is a great app. I like having my recipes with me and easier to change. Currently been using word documents and pdf files of family recipes that will never need changing. It’s easy to add them to this app. Only problem I have is making a shopping list. It doesn’t combine the ingredients to tell you how many cups of chicken broth you need for all the recipes you are shopping for. And they aren’t grouped in alphabetical order so I’m shopping and realized I need more broth. Or bigger container of parmesan cheese. I adore this recipe book, it is easy to use and you can do everything thing on it. The only the my niece has a Samsung phone and she could only get My Big Recipe Book with same cover. She could not download what I sent her, but makes not difference as long as I am sooo happy that I can get it from iPhone or IPad, it also makes grocery lists. I have had this app for many years and it’s always been wonderful. The import feature has been broken for months and its apparently not important to the developer. In my opinion the app is useless without being able to import recipes. I am now searching for another app! Used to love this app and while my older recipes are still stored, it won’t let me easy import especially from allrecipes.com. Have sent multiple customer service requests since August 2018, still not fixed! Customer support says they don’t know when it will be fixed, I think more like they don’t care if it gets fixed. We have used this app for years and it seems like there are a lot of bugs and careless development over the last year. Integration with sites to import recipes does not work on a regular basis, the apps prep and cool time defaults to hours even know it says minutes and when you enter minutes it displays hours. It has become unreliable lately and can’t depend on it for our recipes. Disappointing as the interface is simple and easy. Unreliable data outweighs the positives at this point. The "cutting board diary" UI design needs to go! This skeumorphic abomination belong in a museum! Or, did you finally abandon this app? When is the developer going to fix the issue with importing recipes? I love this app. I have hundreds of recipes in it. But having to type out each recipe is too tedious! Fix it soon, please! This is the best app I have tried. I try other apps, they do not compare to this app. Loved this app until it started saying that the “Database Needs Update” and then the app crashes. I cannot get it to work any longer. I have enjoyed this app for a couple of years and am now quite dependent on it but recently easy import has stopped working. It indicates that it is importing but then just times out. I am not having trouble with internet speeds in any other app incl. streaming, so that can’t be the problem. Support website gets no hits on this problem and there doesn’t seem to be any means for logging a problem. I’ve used this app for a few years. Used to love it but it will no longer complete the Easy Import. Unless the functionality is resolved, I’ll start looking for a new app. I have been using this app along with my girls. It has always opened up and We love it. Today I tried using it and it says New Timer (1) Your kitchen timer has expired OK My app on my phone works. BUT not on my iPad. What can I do? I have been using this app for years and loved it. For the last several months I have been running into problems. Cannot access the search bar, photos won’t download, freezing screen (I have good wi fi connection, no problems with other apps). Have reported problems and they are good about getting back but w/o a fix for the issues. If you can’t search for the recipe you can’t download the recipe. Will be looking for a substitute. Import of recipes no longer works. Please fix. I’ve had this app for years & have loved it. Now I can no longer import recipes. Easy import or custom. The wheel just keeps turning! I entered TWO recipes to start using this app and they stayed in there a total of three days and were suddenly replaced with 24 crappy recipes out of nowhere. I don’t care about those, I want mine back! Actually, just give me my money back. Your app is awful and I have lost my new recipe that I thought would be safe if entered in the app. Ha! Joke was on me. Giving this app one star - only because there has not been any updates in more than a year, yet so many people, including myself that love it and depend on its functionality. This app had so much potential - please listen to your feedback!